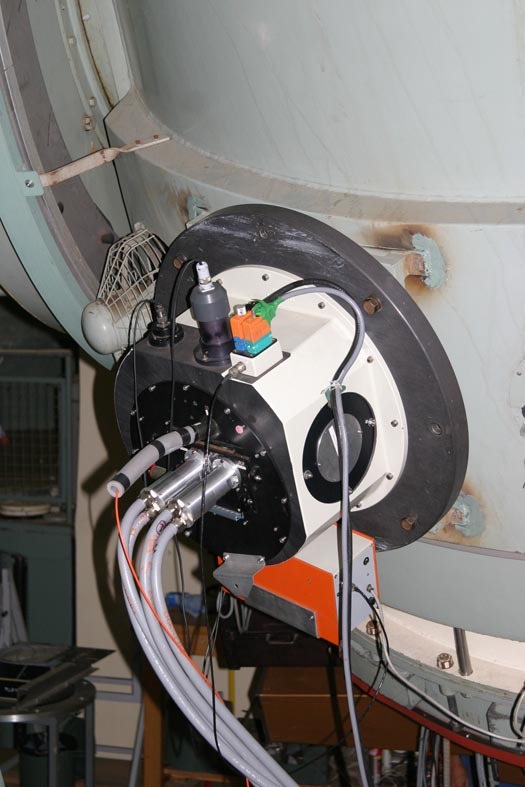 The Cassegrain adapter holding the SOPHIE fiber heads is shown here parked on the side of the telescope tube. At the time this picture was taken, the CARELEC long-slit spectrograph was mounted at the Cassegrain focus. The four fibers in their gray sheaths travel through the telescope structure and go down to the thermally-controlled enclosure in the observing room (the old Coudé room) through the polar axis. A fourth unsheathed (orange) fiber can be used for a Fabry-Perot ELODIE add-on. At the top of the adapter are seen the calibration lamps: Tungsten (small lamp) and Thorium (large lamp). One of the two fibers is used for the star and the other either for the sky spectrum, to correct the cross-correlation profile for the effects of moonlight, or for a Thorium wavelength calibration. The CCD autoguider, which was mounted on CARELEC when the picture was taken, goes on the side port at the right. Click on the image at the left for a larger view.